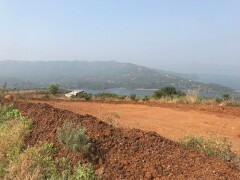 This weekend, take off to this green campsite with views of the Bhatgar dam reservoir. During the day, you'll be able to try adventure activities like archery, rifle or pistol shooting, hiking nearby, or the obstacle course. 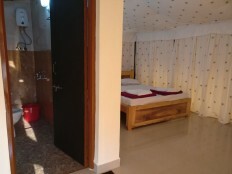 There is a swimming pool, and plenty of indoor activities and on-camp sports like table tennis, volleyball or basketball, and carrom. 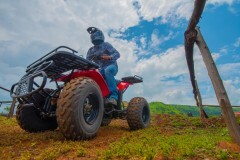 At an additional cost, you can also try out an ATV ride, have a go at the Burma Bridge, or indulge in a fun session of karaoke. At night, you'll sleep in Swiss tents under a starry sky. NOTE: Consumption of alcohol, drugs, tobacco products and cigarettes is strictly prohibited during the trip. 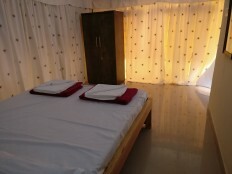 During this camping trip in Bhor, you'll be staying in spacious luxury Swiss tents on twin-sharing basis. Each Swiss tent has an attached washroom and is air-cooled (by water cooler), so you can enjoy the fun of camping with some comforts. 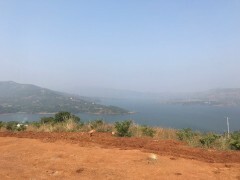 • Spend the weekend camping near Pune with picturesque views of the Bhatgar Dam. • Sleep in Swiss tents under starry skies. Meals are served during certain timings. The staff will be unable to serve any meals outside of such timings. Travellers are required to adhere to instructions of the trek leader during the camping trip to Bhor. For cancellations made more than 10 days before check-in date of the camping trip in Bhor: 12% refund. For cancellations made 0-10 days before check-in date of the camping trip in Bhor: No refund. Accommodation for children younger than 3 years of age is not charged. Accommodation for children between the ages of 3-12 is charged at a discounted price of INR 800 per person. Accommodation for children older than 12 years of age is charged at full price. 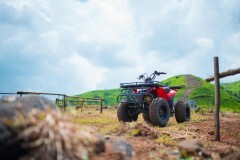 The tour operator reserves the right to cancel or alter the itinerary of the camping trip to Bhor to maximize the safety of travellers as well as staff. 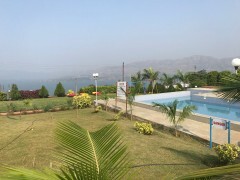 Day 1 of camping near Pune: Check-in and enjoy! Start your camping trip with a bang! Wake up early so you can enjoy the morning mist over the dam. Go for a quick jog or practise yoga in the wilderness for a while. After this, you'll eat a big breakfast. 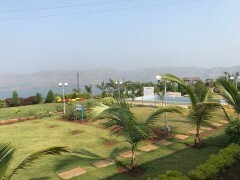 By 10:00 hrs, it's time to pack up and say goodbye to this lovely campsite near Pune. Your trip ends here. You'll be checking in to Swiss tents at this Bhor campsite near Pune. 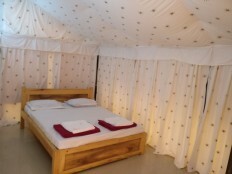 These are twin-sharing tents with attached washrooms and an air-cooler (water cooler), as well as a comfortable bed, blankets, soft pillows and an astounding view. Today's package includes lunch, evening tea and dinner. Your meals will consist of a dal, one dry veg item, one veg gravy item, one non veg item (during dinner only), roti, salad, papad and a sweet dish.